Read it whenever you want. Get it when you join our newsletter! Share where people are sharing every day. Most importantly – when I NEED something shared I’ve already built up the community and audience for it! This is by far the best thing. A steady stream of likes, and shares from your target audience can do wonders. 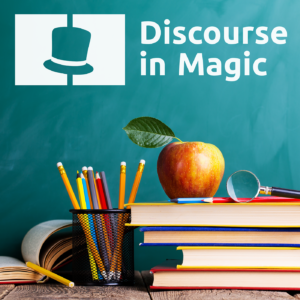 Let’s talk about Discourse in Magic for a second. 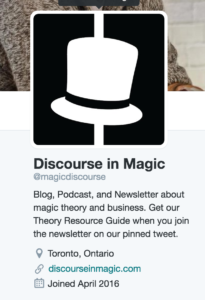 The way we’re constantly trying to spread the word of our existence is very similar to a magician, their website and services. Unless we’re paying for ad’s (which we’re not) or google adwords (which we’re not), People aren’t likely to come to our site. We exist in the massive empty space that is the internet. But, put creating content and sharing on social media in the mix, and you start to generate traffic. For Discourse in Magic in the past 30 days the top 3 places that referred traffic to the website include Facebook, Facebook mobile, and Twitter. What if you could put the right people on the other end of your Facebook or Twitter screen, so that the videos, photos, and posts that you share make them want to begin hiring you, continuing hiring you, or share your material to other people that might hire you! I’m going to teach you how to do that, or at least how I’ve done it. My motto for magic on the internet is that you never know how people are going to find you. The same way you’ve probably ended up on random strangers page you might not have otherwise been on by clicking through a rabbit whole of Facebook, Youtube, Twitter, Instagram or anything else. It’s important that we make it as easy as possible for people to do the same thing with us to know that we do magic, have a website and want to be hired. To do that, we should try to share content as often as possible to help keep people interested. Every social media platform has its own algorithms to decide what content to show and what content not to show for each person. Some people have upwards of 1500 or 2000 friends on Facebook. How does Facebook decide what to show you and what you probably don’t want to see? To oversimplify it, this is how it works: They show you more of what you enjoy and engage in, and less of what you skip over and don’t engage in. It is of course way way way way more complicated than that, with many more variables which are different for each social media platform, but it’s important to keep that structure in mind for existing online. I recommend Facebook, Twitter, Snapchat Youtube and Instagram. Those are at least the ones that I’m super familiar with right now. There are many others, and there will be many others too! You don’t need to jump full force into all of them. Start making yourself a page on one that you don’t already have and start playing around with tips below and sharing content. Or just start implementing these strategies on a page that you already have. However you do it, here are some major ways to use social media to your advantage as a magician. I recommend doing it, as well as including the word magician early on in your description, so that people know what you do. When someone goes to your profile they’re often trying to figure out who you are, and what you do. Since your website is hopefully a beautiful representation of what you do for magic, it’s important that you make it as easy as possible for people to get there from the random place on the internet where they may find you. I know for myself if I go to someones twitter profile I immediately read their description to judge how I want to proceed – If I want to look through their content, follow, tweet, stay or leave altogether. Putting a website in the description is likely to make me click to help evaluate what this person does. Especially if the person might do something interesting. Check out what we did on Facebook, Twitter and Instagram! As I mentioned earlier you want to exist as a magician in the online world. You want to be the go to magician for you friends (and their events), you want to reach people you wouldn’t otherwise reach with shares, likes, tags and hashtags. You want to have an online presence so that when someone looks you up on social media (WHICH THEY WILL) they don’t see an old random post from 2008, but instead a current up to date person chatting with their online audience. 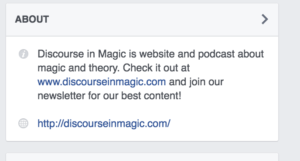 You’ll be surprised what types of responses you get from posting your magic online. Sometimes I’ve had nobody care other times I’ve had my content blow up and reach thousands of people. Sometimes it sparks a relevant debate in the comments, with valid opinions that help me on my journey. Other times, it get’s ignored until a few weeks or months later someone is scrolling through old content finds it, and becomes a fan! Your number one goal is engagement in your content! You have to produce content to does that. Whatever you think will work is worth a shot. Talk about Americas Got Talent, talk about Fool Us, talk about magic stores, magic events, do tricks for people and film it, do tricks for the camera, film a friend doing a trick, mashup old video content, throwback old events and tag the people in it, share an opinion about magic, share a great performance, talk about what’s wrong with the world of magic, talk about what’s right with the world of magic, share a friends magic content, post about events you’re going to be at, teach a simple trick, do a trick related to the time of year. The more people that you get to engage in your magic (online or offline) the better chance that you’ll be found. I promise you’ll be surprised how some things blow up on the internet. Our friends, family, and peers want to be part of your growth. Ahh the wonders of social media in the last few years. 10 years ago events could happen and nobody would know about it. Today, if there’s an event anywhere within my city or a nearby city I’ll know about it on Facebook, Snapchat, Twitter, Instagram and everywhere else. There’s a culture to sharing events that are happening. Not just from the attendees, from the people who are running them. Events are live tweeted, snapped and Instragrammed by the people who run it to share with the online world the excitement of what they’ve done. 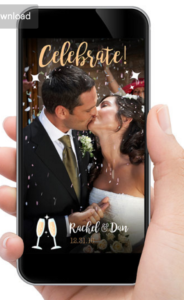 People create location based snapchat filters for their wedding, so that their guests can snapchat that it’s happening with a filter. It’s important that we take part in this conversation. Share a photo/video/post from the event and tag them. With it you’re increasing the chance someone from the event notices you and becomes a fan, you might be able to reach people from the part of the audience that didn’t see you at the event, maybe the person who you did the event with has competitors that might also want you and they’re Facebook friends. Maybe they even share it? You’ll show up on walls and feeds, you get to give extra praise to the people who ran the event, you share with your fans, peers, friends and family what it is that you’re doing. In the summer, I tour camps, and I post about it while I’m at the camps as well as a few months later as a throwback, as well as a few months after that when I make a video mashup of sorts. Each time I see major growth in all of my social media followings, as well as engagement from more of the right people. Most importantly. It helps build the online relationship between me and the people that I’ve worked for. Now, when I post things online they often like it and share it, because they understand online presence. That goes a long way when I’m needing something to be shared. We want people to share the important posts of ours. This is just one way, by turning your past clients into fans who are going to like and comment on everything you do. Sometimes the way that social media is described it sounds tedious and unnatural. The point is to make it the opposite. You don’t always have to share magic content, you just have to be aware of your audience. Share what you want, say what you what. The most important part of social media is that you are human. I often post about what’s my favourite part of my summer when it happens, and share some of the awesome moments. I share cool things I’m doing, places I’m going, and if I feel strongly – opinions I have. People look to your social media to help see you as human outside of actually seeing you in person, be free to be YOU, on social media. Try not to copy other peoples content, just share what would be fun to share with the world. Social media is great because you can experiment. Since you can see numbers for retweets, shares, comments and everything else, you know what people engage in and you know what they don’t. so you know what tends to get you more followers and you know what doesn’t. Try things out, enjoy it, have fun, test and play. Most of us consider ourselves a lurker on social media. We like, sometimes share, but mostly just look around. Instead, be the one who produces things, see what people like. Just remember to keep engaging, but enjoy it while you do. You’re reaching out to people who want to hear from you and sharing cool things with them. The awesome magic that you do, and often magic things around you. Like anything else social media takes practice. I do not consider myself an expert, FAR FROM IT. But I will say that I’ve definitely been having fun, and I have seen it grow my followers, and I’ve definitely seen it impact what I do. It’s great to have an audience, it’s great to have followers. As a matter of fact, having followers is the best thing you can do for your magic! It makes it so much easier to learn what people like and to learn what people don’t like. Both in your magic and in your social media. Have fun, get silly, be helpful, be shareable, be provocative, ask for opinions, share opinions. The internet is a big place Have fun with it. If you aren’t well acquainted here are what I believe to be the top 10 networks for magic (in no particular order). I hope that this guide helped you in some way! To celebrate the release of the guide for social media, we’re launching our Instagram!